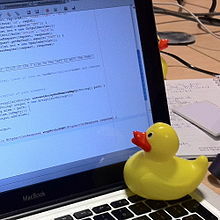 In software engineering, rubber duck debugging is a method of debugging code. The name is a reference to a story in the book The Pragmatic Programmer in which a programmer would carry around a rubber duck and debug their code by forcing themselves to explain it, line-by-line, to the duck. Many other terms exist for this technique, often involving different inanimate objects. 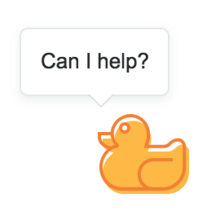 On April 1, 2018, Stack Exchange introduced a rubber duck avatar on their websites as a new feature called Quack Overflow. The duck appeared at the bottom right corner of the browser viewport, and attempted to help the visitor by listening to their problem and responding with a solution. However, the duck merely produced a quack sound after apparently thinking and typing. It referenced rubber ducking as a powerful method for solving problems. Some confused visitors seeing the duck for the first time thought that a malware program had been installed in their computer before realizing it was an April Fools' Day joke. ^ Hayes, David (25 June 2014). "The Psychology Underlying the Power of Rubber Duck Debugging". Press Up. Retrieved 3 July 2015. ^ "Stack Exchange has been taken over by a rubber duck!". Meta Stack Exchange. 31 March 2018. Retrieved 1 April 2018. ^ Purushothaman, Praveen Kumar (31 March 2018). "Quack Overflow - Stack Overflow's take on April Fool!". Adventures (Blog). Retrieved 1 April 2018.